I love the black pepper in this lasagna so be generous with it and don’t grind too fine. Make sure all the individual parts are nicely seasoned otherwise the whole lasagna could end up bland. In a wide based pan sweat the onion, garlic, tomato paste down in the olive oil. Add the mince and cook until it is completely broken down, then add the wine, carrot, mushrooms, sun dried tomato, cook until soft. Finally add the water, salt and pepper. Cook slowly until tender, should take about 1 hour. To make the béchamel boil the milk, then in a separate pot melt the butter and add the flour, beat together and cook out for a couple of minutes. Start slowly adding the milk and beat so it stays smooth, continue this process until it is completely incorporated. Then add the grated parmesan to taste, season and cool. 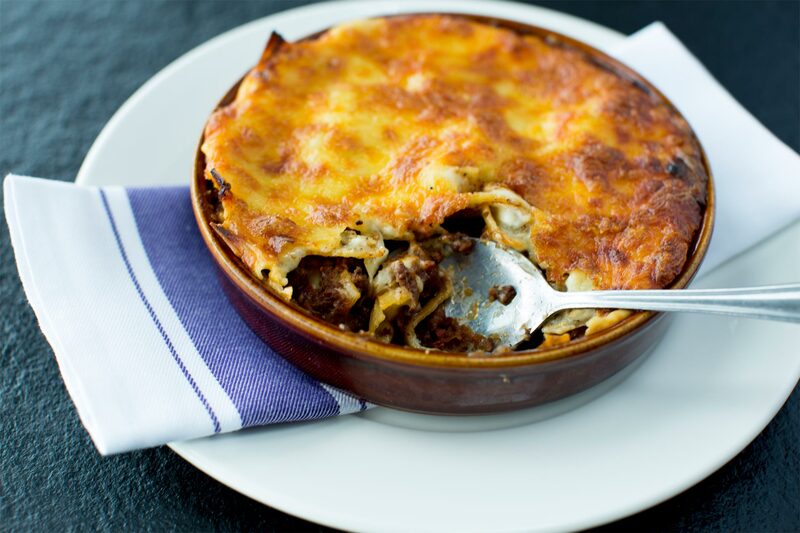 Make the lasagna the normal way by layering first the mince, ground black pepper then pasta sheets then béchamel, mozzarella and repeat this again. The top should be finished with mozzarella. Bake at 180’ for approx. 30 minutes until hot and golden all over.